Marie Osmond Dolls - Chika - Porcelain - by Matilda Dolls! Doll Description: �Chika�, (pronounced Chee-ka), is a stunning vision of traditional beauty whose name means �near and dear�. 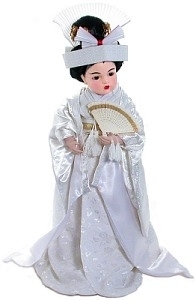 A timeless reproduction �Bru� costumed in a finely detailed satin wedding kimono with an authentic headpiece and fan, �Chika� is a collectible treasure who is sure to become a conversation piece within anyone�s collection. �Chika� is hallmarked on the back of her neck with Marie�s signature and is hand numbered.